Note: Lani had never raced in North America so the Kentucky Derby was his first start here. He broke his maiden in his third start last year in Japan and followed that up winning the Cattleya Sho in Tokyo in late November. 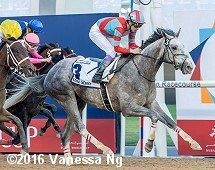 He made his 2016 Debut finishing fifth in the Hyacinth Stakes in Tokyo on February 2, then shipped to Dubai to prep for and win the UAE Derby (G2) to guarantee a spot in the Kentucky Derby field. He was 17th early and finish 9th in the Kentucky Derby (G1) and fifth in the Preakness. He rallied from far back in the Belmont Stakes and finished third. Creator wins the Belmont Stakes - Creator just got up at the wire to win by a nose over Destin while Lani rallied for third, giving an all gray horse trifecta. Get the results, charts, and photos here. Belmont Undercard Stakes Results - There were nine other stakes on the 2016 Belmont undercard, including the Manhattan Handicap (G1), Just a Game Stakes (G1), Metropolitan Handicap (G1), Acorn Stakes (G1), and Ogden Phipps Stakes (G1) won by Flintshire, Celestine, Frosted, Carina Mia, and Cavorting. Get the results, charts, and photos for all nine here. 2016 Belmont Festival Friday Stakes - There were 6 stakes on Friday including the True North (G2) won by Joking, the New York Stakes (G2) won by Dacita, and the Belmont Gold Cup won by Da Big Hoss. Get the results, charts, and photos here. 2016 Belmont Stakes Thursday Photos - Photos and comments for 12 of the Belmont contenders on Thursday June 9 including Brody's Cause, Gettysburg, and Exaggerator plus a bonus of Frosted. 2016 Belmont Stakes Wednesday Photos - Photos and comments for eight of the Belmont contenders on Wednesday June 8 including Exaggerator, Destin, Governor Malibu, and Stradivari. Analyzing the Belmont Stakes Contenders - Our annual analysis using popular angles and statistical trends to see who best matches the profile of a Belmont winner. This year the horses are closely matched with a 3-way tie for the top. 2016 Belmont Stakes Saturday Photos - Photos and comments for five of the Belmont contenders on Saturday June 4: Exaggerator, Brody's Cause, Cherry Wine, Creator, and Lani. Exaggerator wins the 2016 Preakness - He rallied from 8th early to win the Preakness (G1) by 3 1/2 lengths over Cherry Wine and favorite Nyquist. Get the results, charts, and photos here. Black-Eyed Susan Day Results - Go Maggie Go won by 2 1/2 lengths in the 2016 Black-Eyed Susan Stakes (G2) at Pimlico. There were 6 other stakes on the card including the Pimlico Special (G3) won by Noble Bird, the Jim McKay Turf Sprint won for the 5th time by Ben's Cat, and the Allaire Dupont Distaff (G3) won by Ahh Chocolate. Get the results, charts, and photos for all 7 races here. Nyquist wins the 2016 Kentucky Derby - Nyquist held off late closing Exaggerator by 1 1/4 lengths to win the Kentucky Derby with Gun Runner third. Get the results, charts, and photos here. Belmont Winners - all past winners with breeding, connections, time, odds, etc. Belmont Media Guide - for 2016 from NYRA split into sections which are in PDF format. Includes all kinds of interesting stats plus charts for all the previous runnings. Belmont 101 - A basic introduction the the third and final jewel of the Triple Crown. How it began, basics of picking a winner, and how to attend in person. Belmont Stakes Ticket Info - has 2016 the Belmont Stakes ticket applications and locations. Prices and seating diagram are in the application. - on eBay, always lots for sale here. New York Post Sports Section - should have some articles, scroll way down to find them in the "Sports Stories" section.